BEIJING -- The Chinese mainland's chief of Taiwan affairs office on Wednesday called on the press from both sides of the Taiwan Strait to increase exchanges and cooperation. Zhang Zhijun, director of the Taiwan Work Office of the Communist Party of China Central Committee, made the remarks while meeting a Taiwanese media delegation led by Lin Join-sane, chairman of the Taiwan-based Straits Exchange Foundation (SEF). During the meeting, Zhang called on the media to create a "favorable public opinion environment" for the peaceful development of cross-Strait relations. Zhang, also director of the Taiwan Affairs Office of the State Council, spoke highly of the role the press plays in improving cross-Strait ties. 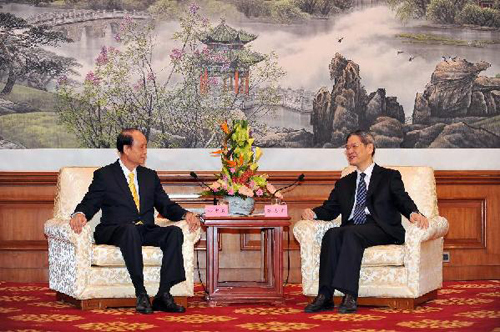 The official praised the mainland-based Association for Relations Across the Taiwan Straits (ARATS) and SEF for their roles in facilitating cross-Strait negotiations and exchanges. He asked the ARATS and SEF to push forward cross-Strait negotiations by safeguarding the political basis of the 1992 Consensus and carry out negotiations in a step-by-step manner. The ARATS and SEF are authorized by the mainland and Taiwan, respectively, to handle cross-Strait affairs. In November 1992, the ARATS and SEF agreed on the "1992 Consensus," which called for both sides to adhere to the one-China principle.